Ideas range from writing letters and investigating research projects, to creating menus and designing powerpoint presentations. Examples of festivals and traditions include Muttertag (Mother's Day), Weihnachten (Christmas), a typical school day and Die Märchen (fairy tales). This book includes analysis grids that show where and how the activities link to the National Curriculum Programmes of Study. Finally, this book provides detailed plans for holding your own 'German Day' at school to raise the profile of MFL and enthuse both staff and children. 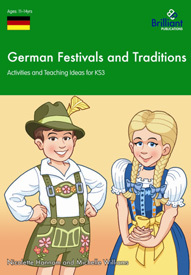 German Festivals and Traditions has been developed for use with children at secondary school (KS3) and full teaching notes are provided.